One thing that I received when I married into my husband’s family was a copy of the Ethington Family Cookbook. It has since become one of my “go-to” cookbooks that I use regularly. I love the old fashioned, simple recipes that are usually made from ingredients that you already have around the house. 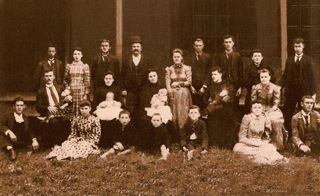 “More than one hundred years have passed since the family assembled for this special moment. They now look at us from their frozen moment in time, and must wonder as much about us and our lives, as we do about theirs. Food really does make up a large part of our lives doesn’t it? And, many times, recipes are passed down from generation to generation and live on in the kitchens of the future. The same thing has happened in my family. A recipe that my Mom used growing up for chocolate fudge icing was always a favorite. It wasn’t until many years later that I learned that it wasn’t really my Mom’s recipe, but my Grandmother’s. My Grandmother has since passed away, and I like to think that I’m going to pass this on to my daughter one day. So, if this post hasn’t made you hungry for some good old fashioned cooking, maybe it will inspire you to think outside the box a little. I got an idea this morning as I was cooking that it would be so wonderful to make a scrapbook that was also a cookbook. It would be full of recipes, along with photos of the people from our past that taught us how to make those recipes. As I use the Ethington family cookbook, many of the recipes include the name of the relative that contributed the recipe. I love that. But, I don’t know many of these people, especially since I am an Ethington by marriage. I would love to have a picture to go along with the name and the recipe so that every time I made that dish, I could think of that person smiling and happy that their recipe lived on in my kitchen. So, this gave me an idea to create a scrapbook and cookbook in one. This would be a great idea to give as a gift to any cook in your family. You could include the recipe, along with a photo of the ancestor that shared the recipe. The cookbook could be as elaborate or as simple as you like, but it would most definitely be a treasure to pass down to future generations.